The official Japanese site for the smaller-sized New Nintendo 3DS clearly states that production of the handheld is over. The text in the little box reads 生産終了 (seisan shuuryou) or “production ended.” This does not only pertain to the pictured model. If you click on the Line Up (ラインナップ) tab, it states すべて生産終了しました (subete seisan shuuryou shimashita) or “Production of all (line-up models) is finished.” This includes the New Nintendo 3DS’s two color variations, white and black, as well as all the special editions. 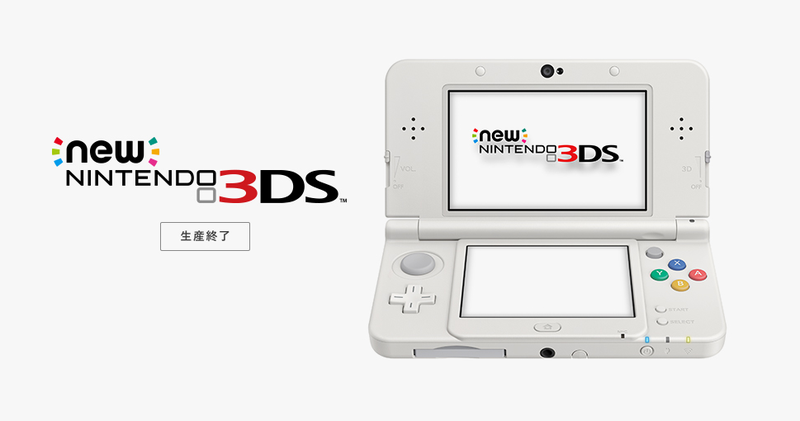 No such notice was made on the New Nintendo 3DS XL’s page, so the larger version will continue being made for Japan. Do not worry! In the past, Nintendo has often made official announces about hardware production for specific models ending with similar notices. Previously, for example, Nintendo announced that 32GB Wii U Premium Set was no longer being made via the hardware’s official site in a similar announcement. Last fall, this is how it announced Wii U production was over. No word yet if this impacts the handheld outside Japan. Kotaku reached out to Nintendo for comment prior to publication, but has yet to hear back. The New Nintendo 3DS was first released in Japan on October 11, 2014 in the regular-sized version and the larger XL one.